Quick question: Do you live in a self constructed tree house in the woods and make your own clothing out of moss? No? Then I would wager that you are busy. REAL busy. Ah this modern life of at least a 40 hour work week, household chores, taking care of your kids AND your parents AND your grandkids. We get so set on getting things done that even when we aren’t busy we feel like we should be. Life can be exhausting. And when life is exhausting what tends to go out the window first? You. Taking care of yourself. And along with that, taking the time to prepare those healthy foods that you know you should be eating. Preparing healthy food can be super duper hard! And if making a healthy delicious meal that you love isn’t hard enough, you also have to consider…the fam. What if the kids don’t like what you make? What if your dear significant other doesn’t like what you make? Are you going to have to prepare three separate meals? Oh la la, just kill me now! When I went plant-based I didn’t know how to cook a thing. Not a thing! My pre plant-based culinary repertoire consisted of taking white tortillas, covering them with shredded cheese and pepperoni, rolling them up, microwaving them, and voila — Matt’s Specialty Pizza Quesadilla! Not only did I have to learn how to cook healthy foods, I had to learn how to cook, period. I actually made the decision to work part-time in order to learn how to feed myself proper food. Thank the good lord that I didn’t have to feed any kids! So I devoured recipe books, spent a lot of time reading nutrition, literally spent hours strolling through never before seen aisles at the grocery store staring blankly at never before seen ingredients. Kale? Broccoli raab? What is this stuff! And I spent a ton of time and money doing so with mediocre results. I’ve been known to eat some pretty terrible food just because it’s there, but this gravy my friend, not even I could eat. It went into the compost! Guess how I would have rather spent those forty big ones and three precious hours of my life. DOING ANYTHING ELSE! But, after much therapy, I’ve clearly let that go as you can see and moved on with my life. Fast forward five years, and I spend a minimal amount of time and energy figuring out what and how I’m going to eat. I eat healthy, am super satisfied, and get the right amount of variety. The best part? I prepare most of my meals in five minutes or less. It took time, experimentation and trial and error to develop the new staples — the quick, easy, inexpensive, and delicious meals that come out great time and time again. But the real insight came from one of my favorite restaurants — a little diner known as Chipotle. Should I be ashamed to admit that Chipotle is one of my favorite restaurants? Absolutely. Do I feel such aforementioned remorse? Hells no. You walk up to the counter, place your order, and two minutes later you have your food and are on the way to your table. It’s always delicious, it’s always satisfying, and the truly amazing part is that you get a fair amount of variety. A bowl? A salad? A taco? A burrito? It’s the same ingredients, put into a different package. There are literally thousands of permutations of possible meals. And while yours truly could happily eat hummus every meal for the rest of eternity, I’ve been told that most humans consider variety the very spice of life no less! 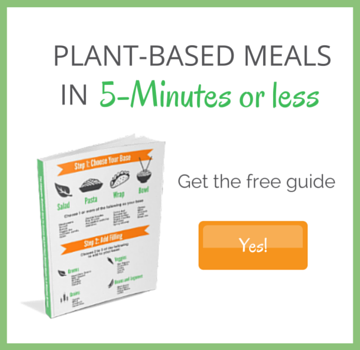 So today I’m happy to introduce The Chipotle Method: How To Prepare 40,320 (Not A Typo) Plant-Based Meals In 5 Minutes Or Less. Pre-prep or buy basic ingredients. Note: I’m not saying that you should eat all your meals this way. Two to three times a week Regan and I pick out a beautiful meal from a recipe book, and we cook a double or triple batch so we can enjoy the leftovers the next day. However, for the other times (read: when I’m cooking for myself) the Chipotle Method is a perfect complement, allowing you to fill in other meals or just throw together a hearty meal when you are short on time. And once you get the idea it is infinitely adaptable. Fill in the options with approved ingredients from your chosen dietary program and you are good to go, whether it’s gluten free, high raw, no oil, potato strong or anything else. Make this work for you, babe! Confession: I have zero artistic ability. My four and six year year old nephews draw much better than I do. But because I care so deeply about your success, I spent the last two weeks creating this infographic and trying to make it beautiful so you would want to print it out and hang it on your fridge. It’s my gift to you, at no cost. Though I do ask that if you find this valuable to please share it with one other person who would also find it useful. And send me a quick email with a picture of your Chipotle Method meal or tell me how its helped you! Meditation Works. Except That It’s Impossible Can You Have Your Health AND a Social Life?